Anyone who would like to prepare the perfect girly party will fall in love with this pink themed birthday party. It’s all about pink, pink, and more pink!! 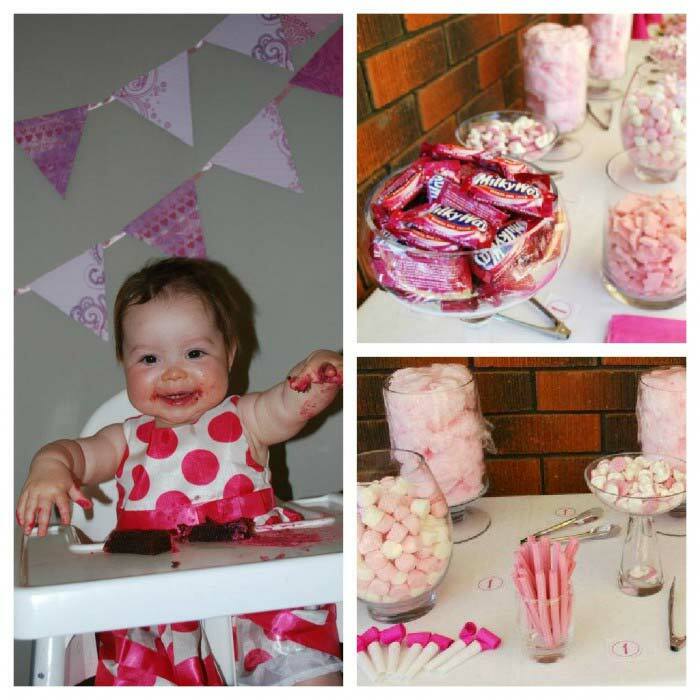 This gorgeous ‘pink party’ was submitted by Laura for her daughter’s special first birthday party. I love the simplicity of the colours, the delightful dessert table and the personalisation in the invitation and displayed photos. It goes to show that sometimes the simplest of ideas can be the most beautiful. Laura said about planning the party: “I loved planning my little girl’s first birthday party. I chose a pink theme, because who doesn’t love their little girl in pink. I’m sure it won’t be long before she starts hating the colour! Everything was pink, including the decorations and food. Of course, the birthday girl was also in a beautiful pink and white dress!”. Everything in this party followed the colour theme of pink. There were pink balloons, pink bunting, and pink food and drink. The party invitations chosen were a great idea for a first birthday. Photos throughout the year leading up to the important first birthday. What could be more adorable! The decorations for this party theme were bright and cheerful and perfect for the birthday girl. As soon as you walk in through the door it would be hard to mistake whom the party is for. Everyone loves the food and drinks at a party. When the food table looks as good as this one, it would be very hard to resist! Laura said “I chose to do a lolly buffet, with all pink and white lollies. I supplied pink paper bags which doubled up as party bags for the kids, saving a lot of time and effort! There was pink fairy bread, watermelon, pink jelly slice, and pink cake pops. I also made a delicious pink lemonade from a Martha Stewart recipe, which was very popular. I made the cake myself and decided to do a number ‘one’, as a tradition so far for my kids first birthday’s. The cake was chocolate mud, covered with bright pink icing and pale pink and white sugar flowers”. The smile from cheek to cheek shows that it was truly a magical event. Have you ever used one dominant colour to create a stunning party theme? Please share, I would love to hear from you. If you like this pink party please SHARE and PIN it so that others can enjoy it too. Hello – I think your page is adorable!!! I’m starting to plan my daughter’s first birthday and would love to have those invitations with the 12 photos that are on your page, but I can’t find them anywhere. Can you help?